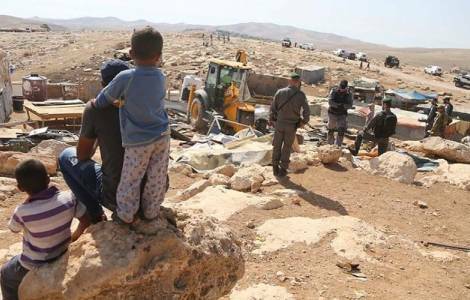 Jerusalem – Yesterday, Tuesday, October 16, three bulldozers continued the work of leveling the land around the Bedouin village of Khan al Ahmar, in the occupied West Bank, east of Jerusalem, in an area considered strategic for the expansion of new settlements of Jewish settlers. The leveling operation is carried out to create tracks to facilitate the entry of military troops, when the evacuation order of the Bedouin population who live in the village starts, before demolishing the houses. On the previous day, there were clashes and moments of tension between the Israeli soldiers and villagers, with the intention of acting as human barriers in front of the advance of the bulldozers. In recent days, the Justice and Peace Commission of the Assembly of Catholic Ordinaries of the Holy Land issued a statement to express once again its dissent and its alarm for the announced demolition of the Bedouin village. “After a long period of legal struggle” the statement said, “the Israeli Supreme Court ruled that the Israeli Authorities are entitled to demolish the Bedouin village at Khan al-Ahmar and transfer the residents to an area near Jericho. Many of these people were already displaced after the 1948 War and are now, once again, being violently uprooted to make way for more illegal Israeli settlements”. The statement appeals to the Israelis and the international community to make their voices heard in defense of the Bedouins of Khan al Ahmar and their right not to be transferred. In the village of Khan Al Ahmer, with 42 huts, there is also a school, attended by more than 170 children of the Jahalin Bedouin tribe. The school is a structure built with 2,200 old tires leaning on each other, as if they were bricks, filled with mud and pressed. The school was built without “permanent” architectural elements, without cement and foundations, in order not to violate the military regulations that prohibit the unauthorized construction of buildings in Area C, the area in which 60% of the West Bank falls, under the control of Israel. The demolition of the village would facilitate the expansion of the Kfar Adumim colony.